The Assign return codes dialog box is used to send status back to the core server based on whether or not a distribution task was successful. In the past, Endpoint Manager only read 0 as a success and anything else would be treated as a failure. This would pose issues for administrators as the application may have installed without error, however, because the return code was sent back as a number other than 0, Endpoint Manager would indicate failure. Vendors maintain lists created by product developers of all possible return codes and the specific outcome that the codes indicate. Now Endpoint Manager has added the ability for administrators to look up return code lists and build templates that can be associated with individual or multiple packages. Each return code can be designated by the administrator to indicate success or failure and send back a custom message indicating specific results of the installation. In addition to using this feature with third-party vendor applications, return code templates can also be created for proprietary applications written by internal developers. Endpoint Manager provides a default template as well as the ability to create new custom templates, copy the default or custom templates, or make modifications to any templates through the Return code template manager. When templates are created, a specific template can be associated with a specific package on the Assign return codes dialog box through the Package return code mappings window. Modifications to templates can also be made from this location. Users have the option to add all possible return codes indicating success or failure or only add additional return codes that indicate success. In the instance that only success codes are added, any return codes not referenced in the template are automatically mapped as failures. Default MSI template: Contains over 50 mappings that cover standard MSI return codes. 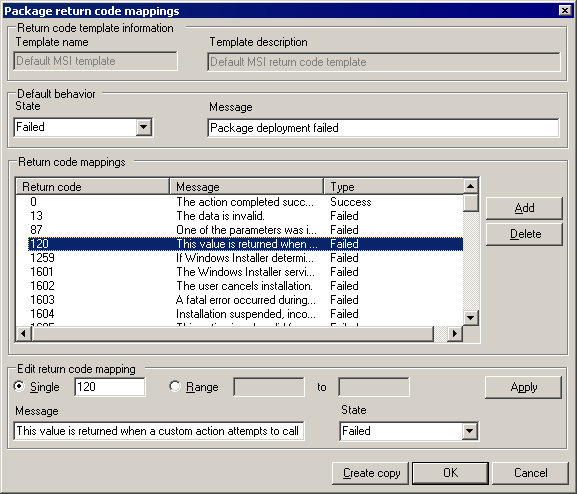 Default non MSI template: Contains a single mapping for return code 0, "The action completed successfully." All non-zero error codes return "Package deployment failed." One of these templates is automatically assigned to the distribution package based on its type. You can change the template mapping in a distribution package's properties.